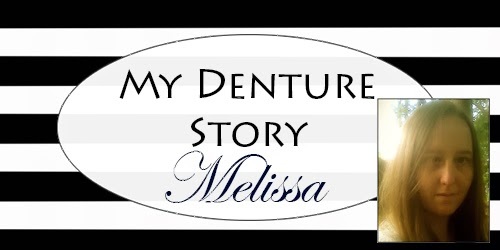 Melissa’s Denture Story | iweardentures! I am a 31 year old mother of three, just finishing up the process of getting my dentures. I never had perfect teeth, as a kid I wore a retainer to straighten them. It wasn’t until I was pregnant with my second child that they started to take a turn for the worse. I really should have had them taken care of 12 years ago when they first started to deteriorate but I just could not afford it. Over the years I learned to live with my bad teeth until my husband convinced me to take the first step. Mainly genetics. My family has a long history of calcium deficiency, receding gums, and weakened enamel. Several women in my family have dentures, most got them at an early age. I told myself a few years ago that I was going to eventually get all my teeth out and get dentures, but part of me never expected it to happen because I was afraid to actually go to the dentist…I was afraid they would try to convince me to “fix” my teeth instead. But my mother told me about her dentist…she spent some time talking to him about my situation and she convinced me to go talk to him myself…he was amazing, honest, funny, comforting…he really is nothing like I remember dentists being when I was a kid. I was given the choice to have my back teeth extracted and get a partial plate, then wait 6-8 weeks and have the rest of the teeth extracted and full plates done…OR have all my teeth extracted and get full plates after 6-8 weeks of healing. By the time I went in for my consultation my teeth were so bad I was practically on a soft food only diet so I opted for the full extraction right away. First I had my 10 back teeth extracted, then 2 weeks later my remaining 18 teeth came out. It has now been 6 weeks with no teeth and I have begun the process of creating the plates. I had my wax fitting today and am expecting to walk out of the office next week with a big smile on my face. I was fully prepared to get dentures a long time ago, but part of me was worried about what people would think. During my post extraction healing process I have had a lot of time to think about what’s going on…I was so worried before I started, but now I’m happy. I had very little self esteem with my natural teeth, but now, even with no teeth I find myself having more confidence…I can only imagine how great I’m going to feel once I have nice bright teeth again. At the moment I don’t face any real challenges. But after being on a mush diet for so long I can imagine it’s going to be interesting to actually eat real food again. My husband has been great about the whole thing. We first got together before my teeth started to deteriorate, he’s been with me every step of the way. After years of watching me suffer and watching my self esteem fly away he told me to call the dentist…I tried making excuses about how we can’t afford it but he told me we would make it work. My husband, my kids, my family…they have all been there for me every step of the way. On top of the usual oral hygiene routine, I have adjusted my diet…I realized that on top of my genetic problems, my diet probably didn’t help my situation…so I have cut WAY back on the soda and sugar. That's wonderful Melissa. You have a full support of your husband and the whole family. You must e a lucky person. Loved to hear that. Glasgow Denture Studio has over 40 yearsâ€™ experience dealing with cosmetic dentures, denture repairs and denture implants. I have always had a good experience and would recommend them to anyone in Scotland. I like to know when I do a job it is done, and my reputation depends on the work that I do. I am a dentist in NY and I know the importance of patient satisfaction. I refer all my lab cases to Precision Esthetics because I am confident that both myself and my patients will be satisfied at the end of the day. I get European quality products made in America and no complaints. Visit their website on http://www.precisionesthetics.com or call (800)-942-3368. Really Interesting post to read…. I have space between my teeth. I want to get a healthy smile on my face. I have read complete this blog. This blog enables more information about oral health problem. Please suggest any technique for removing spaces between teeth. Being able to get dentures is such a huge blessing. I can't imagine what it would be like to go without having any teeth at all. It would be really hard to do just about everything. I am always amazed by how well dentists are able to fit dentures to your mouth. Dental technology has really developed a lot over the last couple of years. Your story is super fascinating. I had no idea that calcium deficiency was something that could be hereditary. When I think about hereditary issues, I hadn't considered teeth. If I were in that situation, I am not sure if I would do dentures or implants. It is really good to hear that you were able to get good advice from your mom. It is always a good idea to ask your friends and family for references. That is definitely one of the best ways to find good dentists. It is insane how genetics have such a role in the loss of teeth. It is really great to hear that you have been able to handle these genetics so well. Interesting flow of this post. Thank you for sharing your story. Thanks for very nice information…………………..
Inspirational Story. We are from Aastha dental Care – Root canal Treatment in Bhubaneswar and wishes a great future ahead.